Training is based on the best-selling book of the same name. 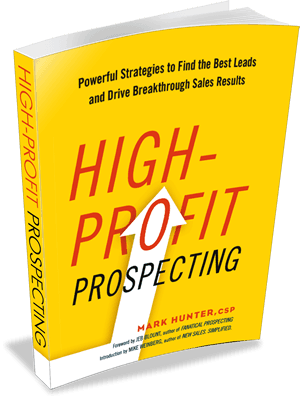 Prospecting cannot be treated as an afterthought in the sales process. No, prospecting must be seen as the foundation on which the sales process is built. Poor prospecting and the issues surrounding it are typically an outcome of other poor habits. Primarily, a sales force knows what to do, but not how to do it. This ultimately impacts their confidence. Giving the sales force tools, strategies and verbiage to have difficult conversations will drive confidence — and this leads to actions that lead to results. The program is extremely hands-on, with participants focused on building their own plan. The program can be delivered in any length of time from 4 hours to 2 days. Length of program determines the number of topics covered.